Karamba Casino has been active on-line since 2005. It holds a license from Malta Gaming Authority and the UK Gambling Commission. 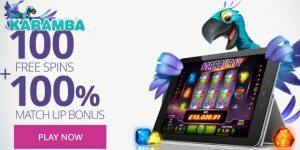 Karamba Casino has found a way to attract its players to log in regularly and try their luck at its games of chance. The video slots collection fascinates and engages them in regular gambling. The colored design scheme and the cheerful blue feathered parrot mascot adds to the joyful atmosphere. The cartoonish illustrations on the banner sustain the party mood. Games are stored under clear categories: Video slots, casino, live casino, games, all games and most popular. Players that do not desire to engage with real money in the risk of losing it can try the demo play section. It contains all the games available on real play except the live casino. A budget of $500 can be spend as desired for slots, casino games or scratchcards. Live chat function is accessible for the demo play. Promotions are offered almost on a daily basis from the minute you log in. In addition, Karamba Casino rewards all its players every month no matter how much or how little you have played. Of course, the value of the reward is bigger for the high rollers. It usually consists in cashback, freespins, faster withdrawals, a personal account manager or different VIP promotions. The games at Karamba Casino are mainly provided by NetEnt and Microgaming, but you can also find a few from NeoGames and Cryptologic. Famous games, such as Starburst, Gonzo’s Quest, Jack & the Beanstalk are the biggest attraction in the slots section. Casino game enthusiasts can play different roulette or blackjack versions, but also video poker, instant win games, scratch cards or live casino are available. The welcome bonus is 100% match up to £200. The bonus applies for deposits of £10 or higher. The deposit will show up immediately into your account. An additional 100 free spins are given in the first three days of log in, as following: 20 in the first day, and 40 for the second and third day. The welcome bonus has to be wagered 35 times, within 21 days. The second and third deposit are rewarded with 40 free spins each. The players that do not desire to bet on real money, have the option to ask for the 20 freespins no deposit bonus. Karamba organizes regularly tournaments and rewards for all the players. Each £20 wagered is rewarded one bonus point. The higher your position in the VIP scheme, the bigger the value of the bonus points. NetEnt games are usually designed for smartphone and tablet users. The Karamba mobile casino keeps the same features as the desktop version. Registration and promotions are some of the useful features that you can use to play anywhere, anytime. Deposit and withdrawal methods are Master Card, Visa, wire transfer, Neteller, Skrill, Boleto, ClickandBuy, EcoPays, Entropay, Eps, Fundsend, iDeal, Lobanet, Neteller, Nordea, POLi Payments, Sofortuberweisung, Ukasn and Paysafe. Specific methods are available depending on your location, so check your account and look at the method that best suits you. The minimum deposit and withdrawal are £10. The on-line casino aims to process all the withdrawals within 48 hours. Pounds, Euro, Swedish and Norwegian Kronor, Australian, American and Canadian Dollars are the accepted currencies. The customer supports’s motto is CARE, which stands for Customers Are Really Everything. The help section, live chat, phone or fax are the ways to get your questions answered. Live chat is available for seven days a week, between 8 am and 1 am CET. David Weir, a University of Michigan researcher, noted that a previous NFL sponsored study he conducted showed 96 percent of league retirees reported no cognitive impairment or dementia.”Those numbers may or may not indicate an elevated risk from a career playing football,” he argued. “We can’t draw a conclusion, and no responsible scientist would do so.”Dr. With me on the call today are Andrew Wilson, our CEO; and Blake Jorgensen, our CFO. Frank Gibeau, our EVP at Mobile and Peter Moore, our COO will be joining us for the Q portion of the call. The drink faces stiff competition against Pepsi’s (NYSE:PEP) Gatorade and Coca Cola’s (NYSE:KO) Powerade, but has managed to nearly double sales. While this is only a partial stake, it further validates the distribution relationship between BodyArmor and Dr. Okay, so I’m gonna have Melanie go through a quick assessment here and make sure that this, we’re gonna pretend that her right knee has just gone though an ACL repair Cheap Football Jerseys and she’s going a one legged squat. I’m looking to check here stability as she goes through that squat looking to make sure she maintains that good cheap oakleys stability in her knee and that there’s no pain. In June 2009, it replaced Citigroup in the Dow Index, which quite ironically Travelers was spun off from in 2002. Having achieved the status of a Dow component, it easily meets my sustainable business requirement.. Games that have rapidly risen to popularity, including Zynga’s own Farmville, have experienced just as rapid declines. Even seeming franchises such as Angry Birds are not immune to shifting tastes. ESPN’s Chris Low broke the story about Kiffin’s gas cheap oakleys pumping comments. According to the story, Kiffin said that if Jeffery “chose the Gamecocks, he would end up pumping gas for the rest of his life like all the other players from that state who had gone to South Carolina.” That comment was laughable at the time, as the Gamecocks are known for sending players to the NFL.. It has been over 40 years since baseball has seen even a 30 game winner. Again, with fewer starts available and a more competitive field this record will ray ban sunglasses stand for the ages. The Texans quickly became one of the worst teams in the 2013 season, and are in cheap jerseys need of some serious help as they enter the 2014 season. Mike Vrabel should wholesale football jerseys china have a bit of an edge when helping the team prepare for the Patriots since he is still familiar with Bill Belichick as a coach, although the Patriots are also still one of the Cheap nfl jerseys best teams in the league..